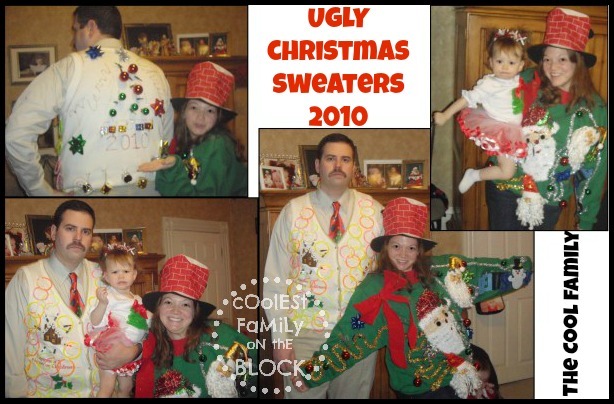 In 2010 our family started a new Christmas Eve tradition: Uncle Ugly’s Christmas Sweater Jamboree, which is just a fancy way of saying “Ugly Christmas Sweater Competition”. It was a hit and my very own Cool Daddy came away as the victorious champion! 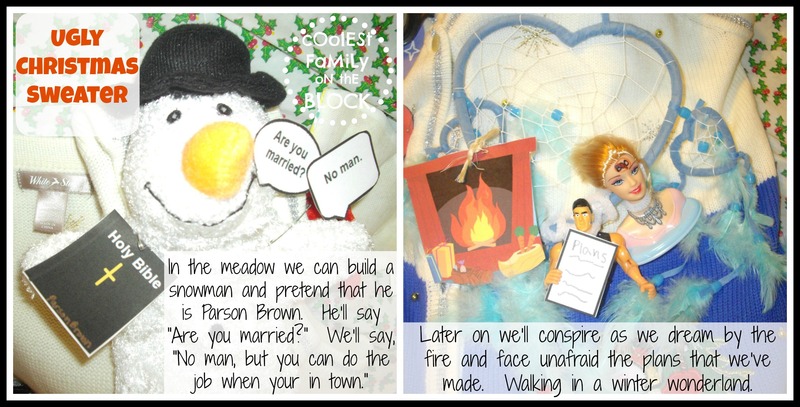 For 2011 some contestants upped their game, others dropped out altogether (party poopers). Let’s start things off with a group photo of the cool family. 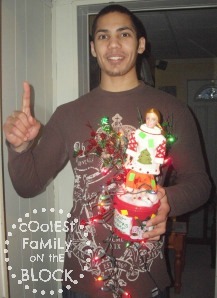 Here is Cool Daddy, last year’s Ugly Christmas Sweater Champion. We were all relieved that he chose to ditch the creepy mustache from last year. It’s difficult to describe what’s happening with his sweater, because I honestly don’t know. He’s sporting a lovely lady’s sweater vest with flashing snowflake lights on one side and candy cane garland on the other. Look closely and you will see a gold and a red tinsel tree on either of his shoulders (blends into the background, boo!). He added some Christmas underwear from the Dollar Tree because…well, I don’t know. I have no idea why anyone would pin underwear to their sweater, but it happened. I apologize. He paired his sweater with some Christmas tree pajama bottoms and a snazzy plastic candy cane cane. Yes, a cane cane. 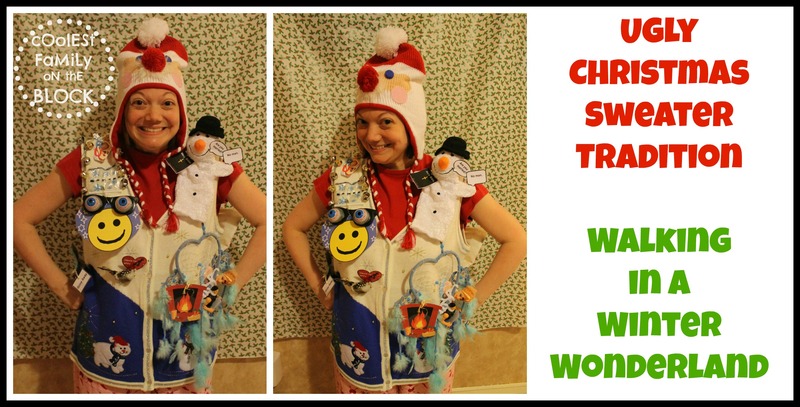 Here I am rocking an ugly Christmas sweater, maternity style! I was almost 8 months pregnant with Jonathan. I trimmed a red sweater vest with tacky multi-colored disco ball garland. My baby bump is adorned with a Christmas wreath with flashing snowman lights. The wreath is topped with double bow goodness, a giant felt red bow and a giant shiny silver gift bow. A Santa Claus stocking on the side is the perfect place to tuck the battery pack from the lights. 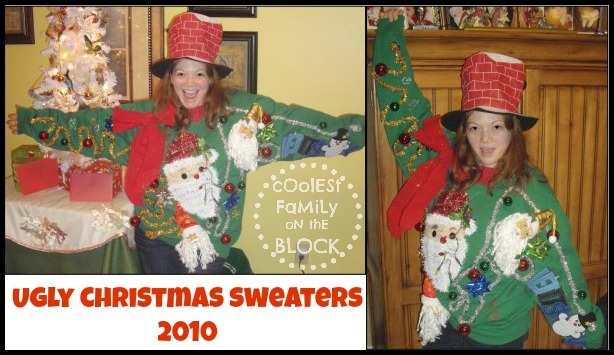 In 2010 my sister totally flaked out on the sweaters and barely participated. This year she wore a red sweater, which was an improvement. 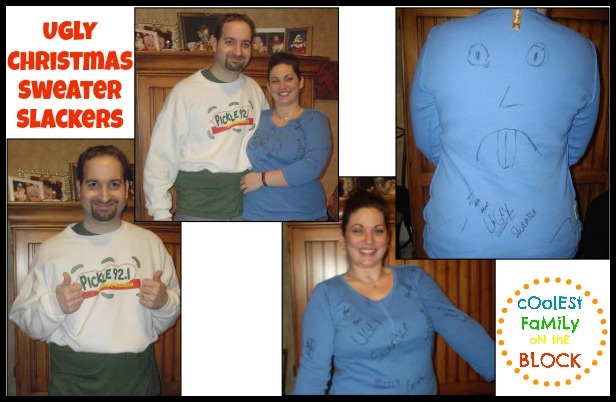 She altered the sweater by writing “Merry Christmas” in magic marker and attaching a baby onesie, or is it a dog shirt? She’s wearing a baby bib around her neck. Why? I don’t know. I’m confused by the whole thing. Perhaps the “bah humbug” on her shirt is the key to it all. I do enjoy her headgear which is actually a tissue box cover. Last year after my sister dropped the ball my brother-in-law was stuck with a completely un-Christmasy sweatshirt. 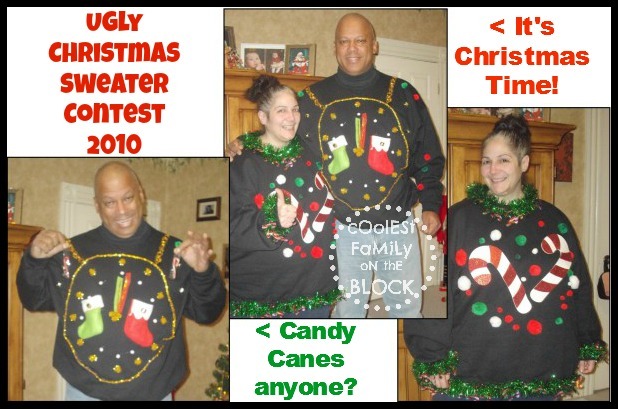 He did bring home the title of “Most Naturally Ugly Sweater” in 2010 because his was the only one completely unaltered. In 2011 he was in it to win it. This completely unaltered black sweater vest has charming plaid accents that add country appeal. 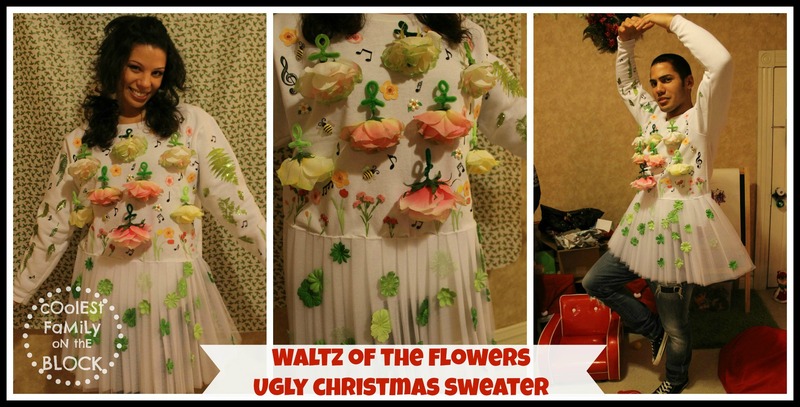 The sweater is perfectly complimented by a turtleneck covered in poinsettias on a field of green. My cousin, Ben, took the loss hard last year. 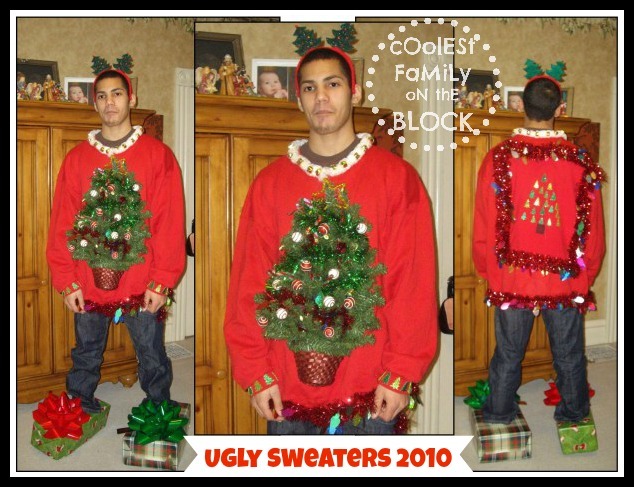 He had come with his game fast on, an entire Christmas tree on his chest, and presents on his feet and he still failed to bring home the title of “Ugly Christmas Sweater Champion”. In attempt to keep history from repeating itself, Ben kicked things up a notch with this celestial beauty. A swatch of blue framed in fluffy fiber fill is the perfect heavenly background for this dollar store plastic doll posing as an angel. Perched on a tuft of cloud she is just out of reach of her harp made of Styrofoam. She is accompanied by a few other heavenly hosts and doves. Accessories include a marabou halo, angel wings, and puffy cloud shoes. My cousin Aunia is a brick house, or at least her sweater is. Strategically placed strips of white foam on a red shirt creates the illusion of bricks. In the center sits a door decorated with a lovely lit wreath. That’s not all…open the door to find a festive living room complete with Christmas tree and presents! Ugly or adorable? 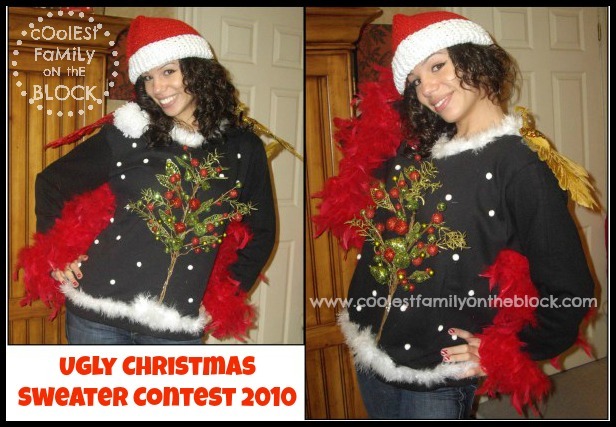 Now is your last chance to guess who was the winner of the 2011 Ugly Christmas Sweater Contest. Click below if you need a refresher on the rules. Ben was more than pleased to earn the title of Ugly Christmas Sweater Champion. My baby bump and I waddled away with the title of “Most Overall Festive Attire”, and Matt claimed the title of “Most Naturally Ugly Sweater” for the second year in a row. Just a boy kissing his trophy. Nothing to see here, people, move along. 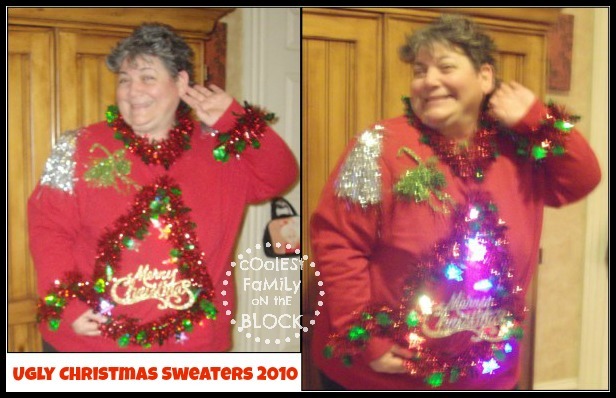 Does your family have an Ugly Christmas Sweater Tradition? 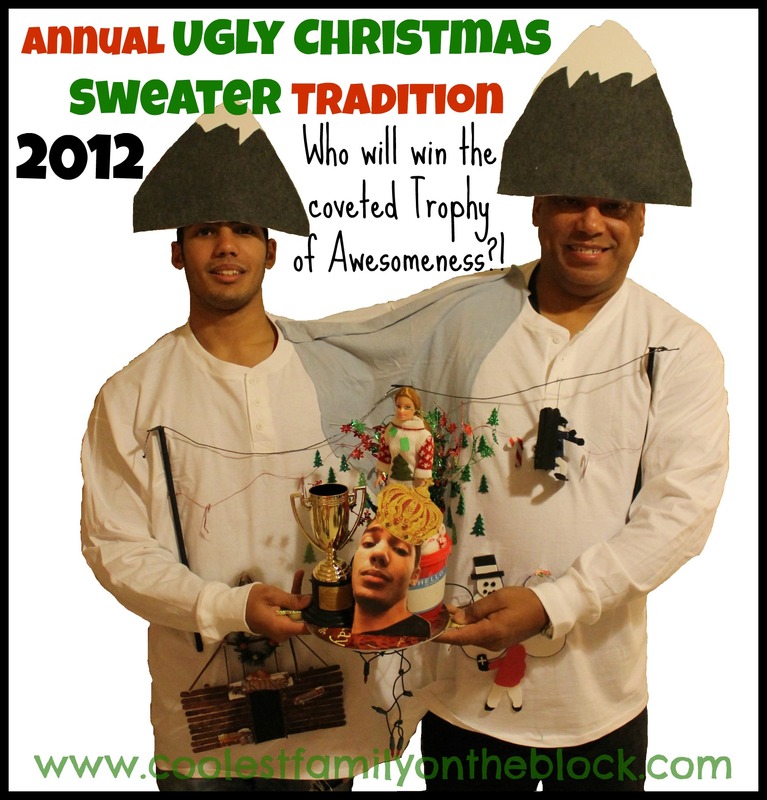 Cool Daddy came up with the idea of having an Ugliest Christmas Sweater competition for our Christmas Eve celebration. It sounded just like the weird sort of thing our family would love, so I agreed and we made our plans. 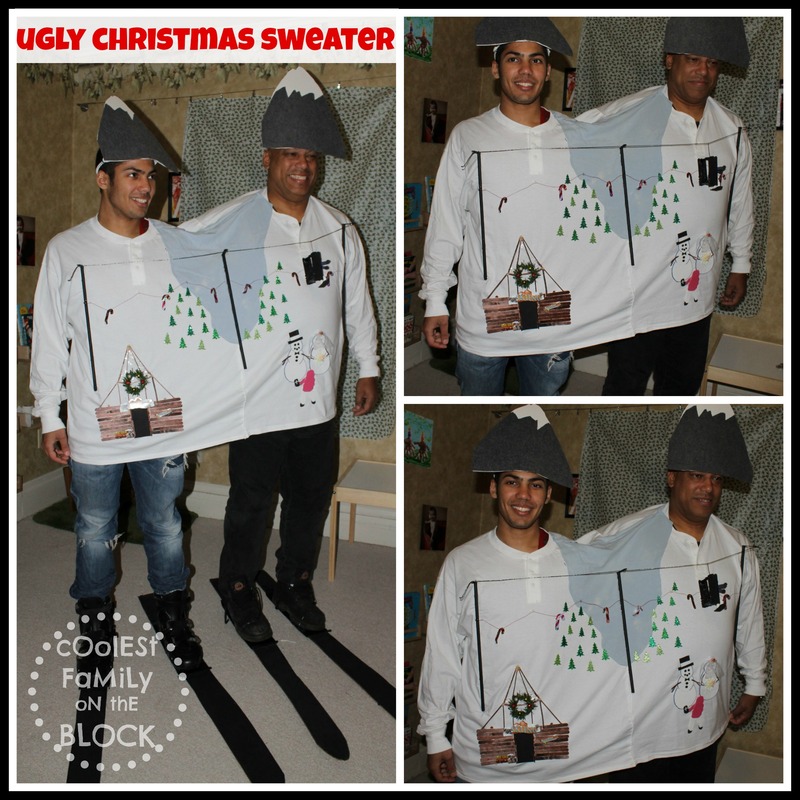 On Christmas Eve Cool Daddy and I hosted The First Annual Uncle Ugly’s Christmas Sweater Jamboree. Everyone in the family participated except for the babies since we figured that a tricked-out sweater might be a choking hazard. 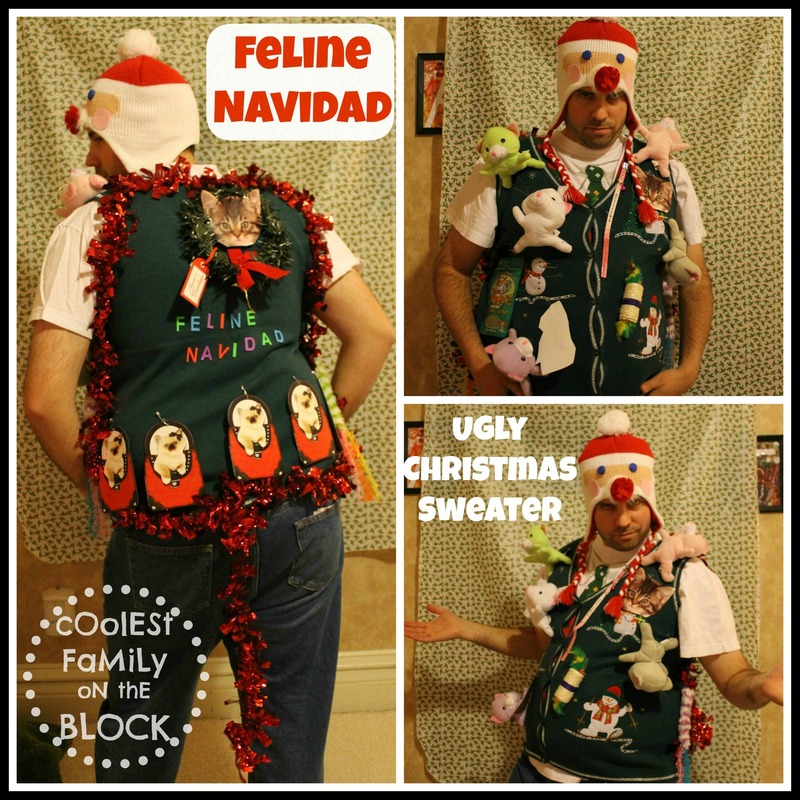 The Ugliest Christmas Sweater Champion would be awarded the Ugliest Christmas Sweater Trophy of Awesomeness. Contestants also had the opportunity to win the title of overall Most Festive Attire and Most Naturally Ugly (unaltered) Christmas Sweater (they’d win the title and bragging rights, but no award). 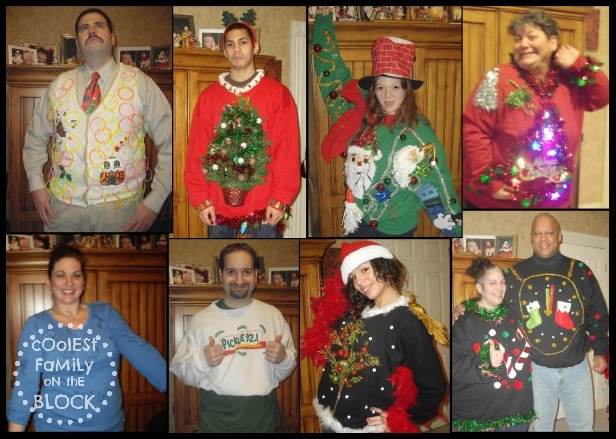 Here are all of the 2010 Ugliest Christmas Sweater Contestants…can you guess who won? 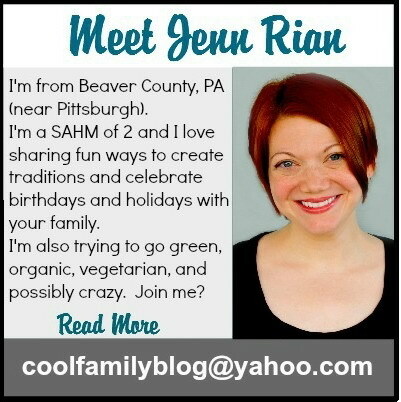 First here we are, the Cool Family. I think our sweaters prove just how cool we really are. Ahem. When planning the party I didn’t consider the fact that Adaline might be freaked out by all of the sweaters. I thought she would love them and try to pull at them. Adaline was freaked out by all of the sweaters. Isn’t that the ugliest Santa head?! I found it at The Dollar Tree. What a treasure. My hat had Santa legs coming out of the top (so that it looked like Santa was going down the chimney), but the legs kept flopping over, so it just looks like I’m wearing a brick-print top hat 😦 . Still awesome, but not quite the same. Sigh. Cool Daddy can rock a woman’s sweater vest like nobody’s business. There’s lights on the front and back (but again, they’re hard to see) and it’s covered in glow sticks. I’m not really sure why. He’s wearing a Christmas tie that plays Jingle Bells (um, awesome, anyone?). He purposely shaved off his goatee to have his creepy mustache compliment his sweater. So my sister waited until only a few days before to get her sweater together. Then decided that she couldn’t find anything (that she was willing to pay for), so she turned a shirt inside out and wrote all over it with a Sharpie. Um, okay. She did even less for her husband having him wear an old sweatshirt, which for some reason he decided to fold up into a mid-drift. Sure. I wised up when taking the picture of my mom’s sweater and turned off the flash so that you can see her lights. The lights on her sweater were sa-weet! They were shaped like stars and changed colors! My cousin Ben is sporting a Christmas tree sweater, complete with presents for shoes. A jingle bell fur collar adds musical appeal while tinsel and Christmas trees on the back make sure that you have a Happy Holiday from every direction. Oh yes. Okay, so I think that my cousin, Aunia’s, sweater is actually kinda cute. And I would totally wear it to the grocery store peacocks on the shoulders and all. She’s stylin’ with a pear tree on the front of her sweater, peacocks on her shoulders (because apparently partridges are hard to come by) and feathers on the sleeves. My aunt, A.C., is trimmed in lovely green tinsel and featuring giant candy canes surrounded by puffy balls. My uncle, U.A., is wearing a sweater that I originally thought was a reindeer head…and now I think might be a clock. Not really sure. before scrolling down to see the results. Okay. 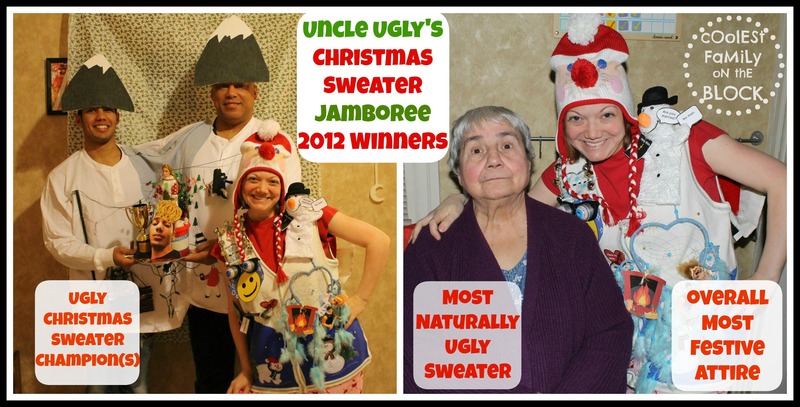 So here are the 2010 winners of Uncle Ugly’s Christmas Sweater Jamboree Ugliest Christmas Sweater Contest. My brother-in-law, Matt, won the title and bragging rights for Most Naturally Ugly (unaltered) Christmas Sweater because he had the only unaltered shirt…even though it wasn’t Christmas-y. But my sister said that it has red and green on it so it counts. I guess. Ben won the title and bragging rights for overall Most Festive Attire. Wearing an entire Christmas tree on your chest will do that. 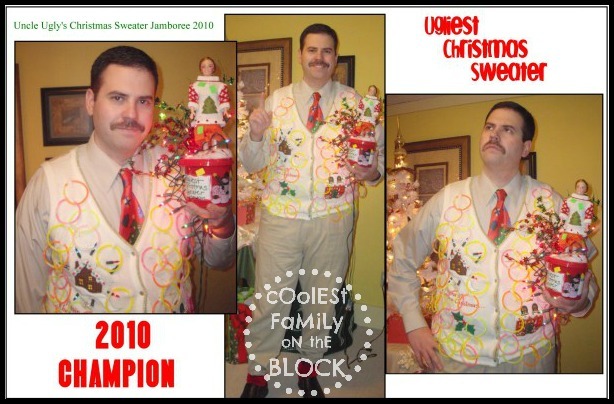 My very own main squeeze, Cool Daddy, rose victorious as the Ugliest Christmas Sweater Champion. I think we all voted for him because we were so creeped out by the mustache. And we wanted it to go away. And this is supposed to be a picture of Ben sad because he didn’t win the trophy, but the sad picture that I took of him ended up being really blurry and so I used this one instead wherein he is kinda smiling and holding up one finger even though he was very sad and truly tortured to the very core of his being for not having won the trophy and he must be pretending that he is number one in order to make himself feel better and not cry in front the entire blogosphere. I thank you for not laughing at him during his hour of great pain and distress. (Nothing says, “Feliz Navidad!” like a good nonsensical run-on sentence. This year we’re starting a new Christmas tradition with our family. We will be hosting the Christmas Eve festivities at our house. 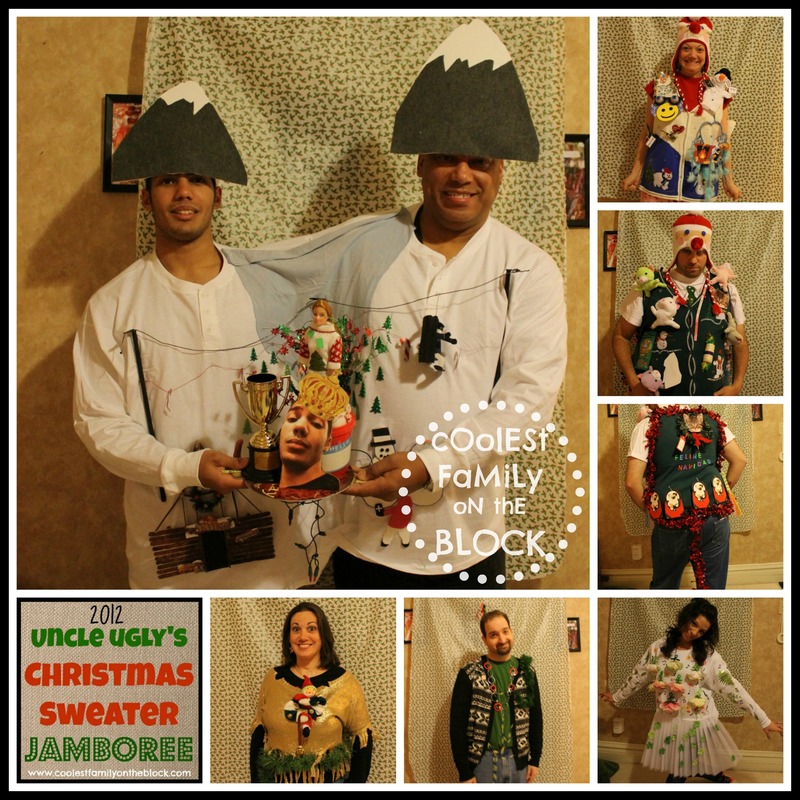 And not just any festivities…Uncle Ugly’s Christmas Sweater Jamboree featuring the Ugliest Christmas Sweater Contest! I thought that I’d share the Ugliest Christmas Sweater Contest Rules with you in case you were planning your own party this year. The rules don’t really mean anything, and we’ve never really stuck to them (they were just a way to keep my crazy family from cheating), but here they are anyway. To be eligible as an Ugly Christmas Sweater Contestant you must wear a Christmas or Winter themed Sweater, Sweatshirt, or Sweater Vest to the Jamboree. Turtlenecks and long or short-sleeved t-shirts will not be accepted. You may wear such items underneath an Ugly Christmas Sweater-vest, but it will not be considered part of your sweater and therefore not eligible for judging. 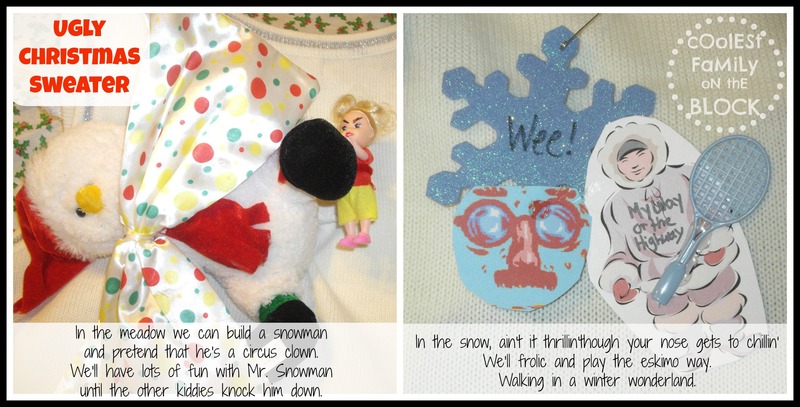 You may add to or alter your Christmas sweater however you like, have fun and get creative. 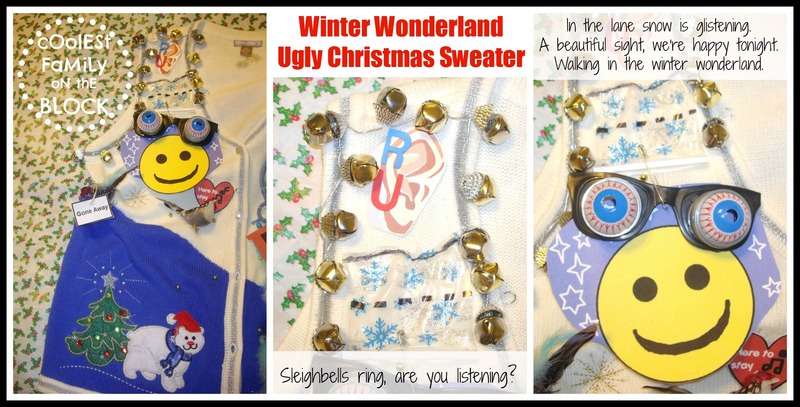 Additional items such as hats, jewelry or other festive attire will not be considered when voting for the Ugliest Christmas Sweater. 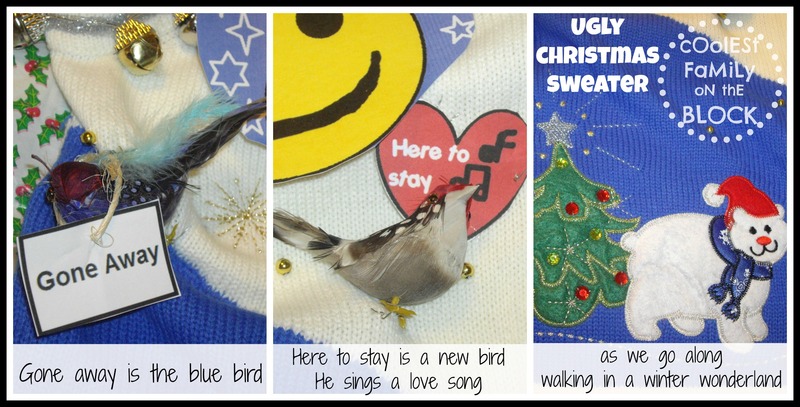 An item must be attached to your Christmas sweater in order to be eligible. +Putting on your ugly Christmas Sweater after entering the jamboree (You must be already wearing your sweater when you show up to the jamboree.). 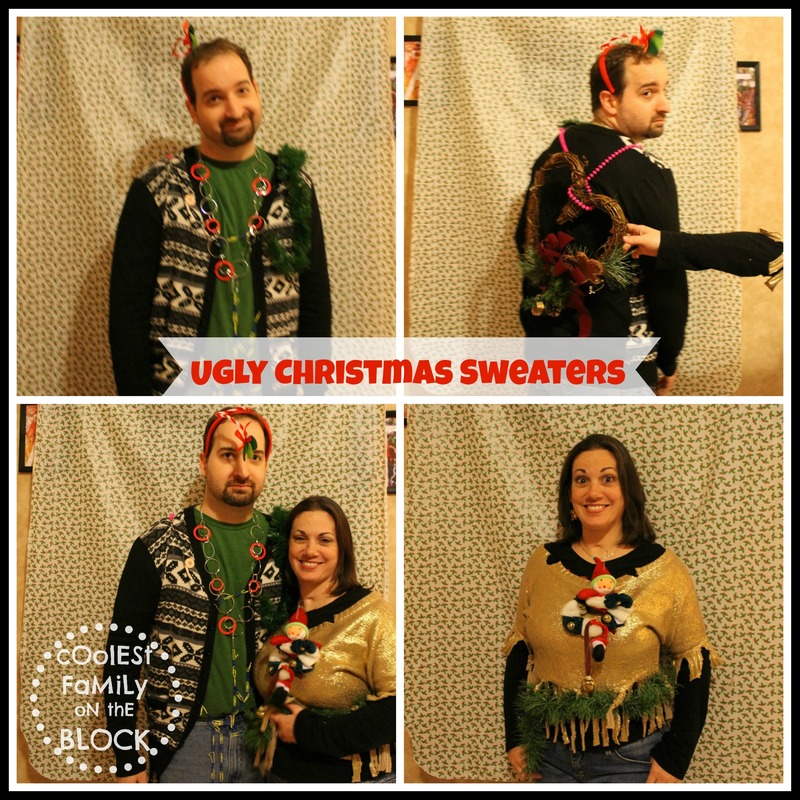 +Removing your sweater before the Ugliest Christmas Sweater Champion has been announced. +Altering your Christmas sweater after entering the jamboree (Any and all alterations or additions to your sweater must be completed before entering the jamboree.). +Swapping your sweater with another contestant before the Ugliest Christmas Sweater Champion has been announced. +If you are overheard using the word “boring” anytime before the Ugliest Christmas Sweater Champion has been announced. 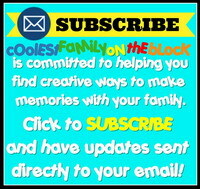 +If your “sweater” is actually a t-shirt, turtleneck, or any shirt other than a sweater, sweatshirt, or sweater vest. 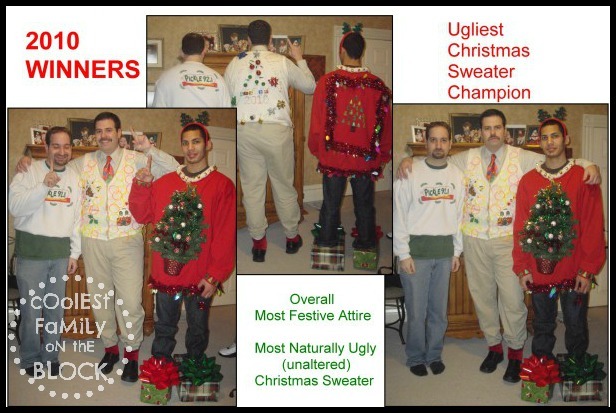 How will the Ugliest Christmas Sweater Champion be determined? 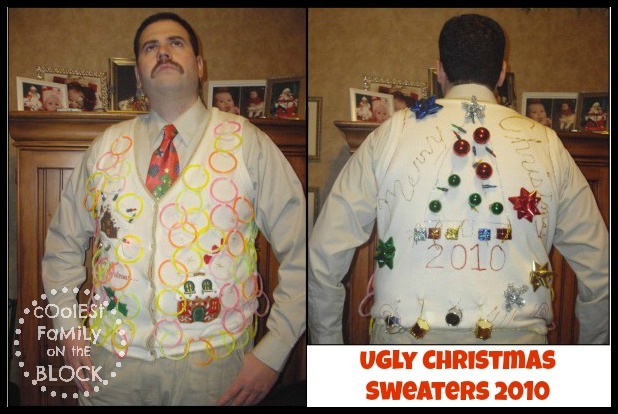 All eligible Ugliest Christmas Sweater Contestants will have the opportunity to vote for the champion. You may not vote for yourself. You must vote for someone. Anyone not competing and anyone who has been disqualified are not permitted to vote for the Ugliest Christmas Sweater Champion. 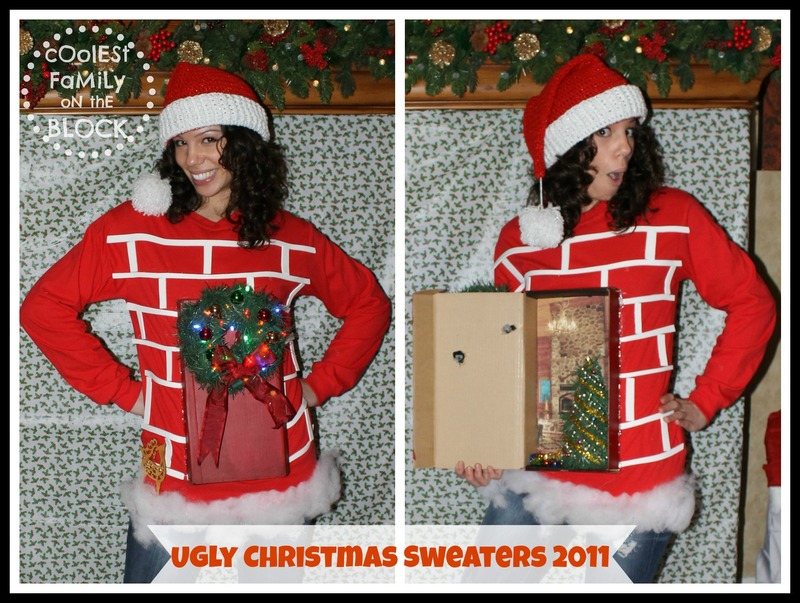 What will the Ugliest Christmas Sweater Champion receive? 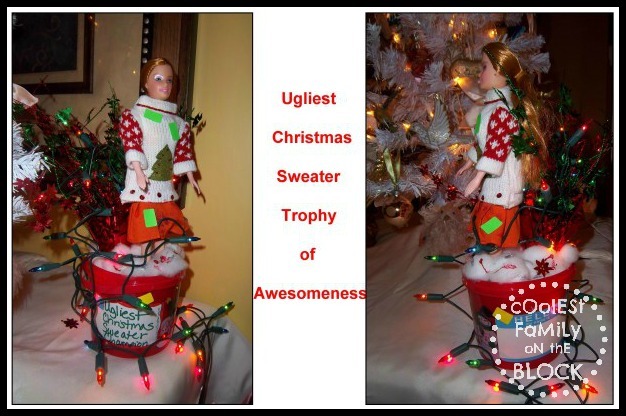 The Champion will receive the coveted Ugliest Christmas Sweater Trophy of Awesomeness. Will any other prizes be awarded? Contestants will also have the opportunity to vote for the person with the overall Most Festive Attire and the person with the Most Naturally Ugly (unaltered) Christmas Sweater. The winners of these categories will win only the title and bragging rights. No prizes will be awarded. Where do I get an Ugly Christmas Sweater? I don’t know. That’s your problem. I’ve got my own sweater to find. 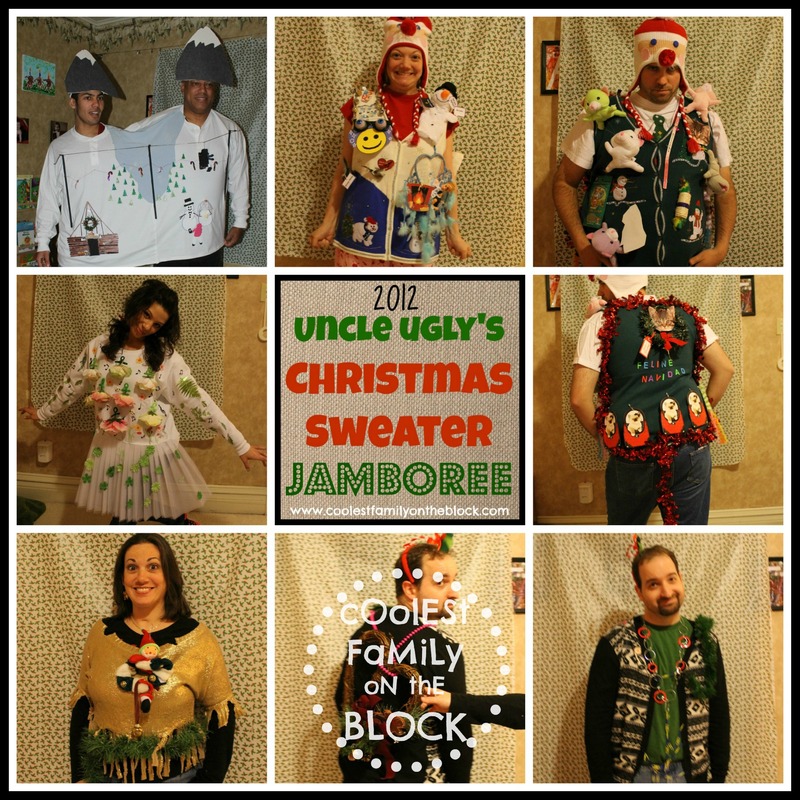 Uncle Ugly’s Christmas Sweater Jamboree is on Christmas Eve! 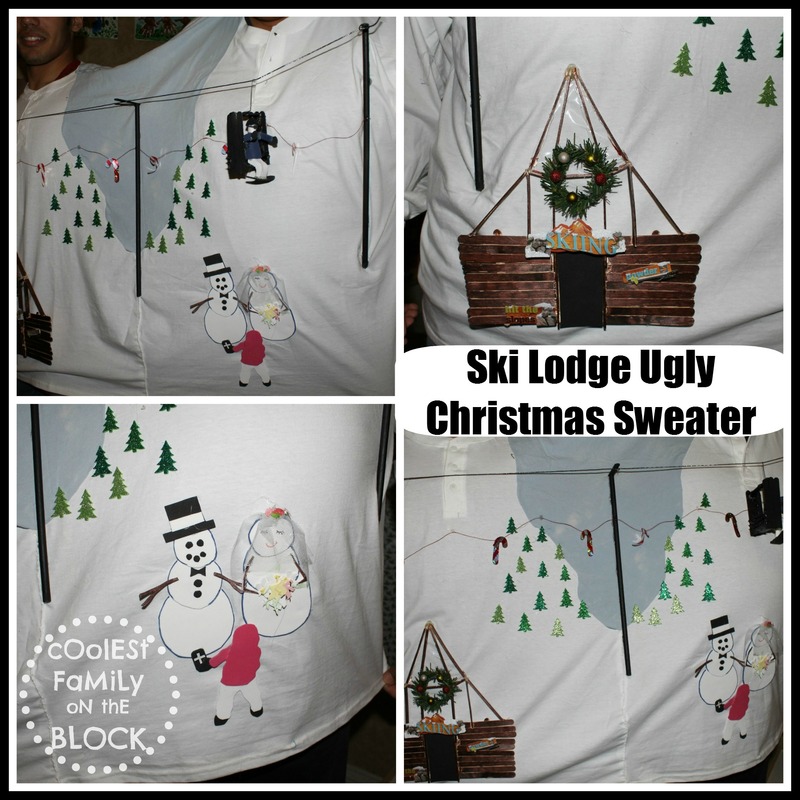 Start looking for or making your Ugly Christmas Sweater right away!